This pan-roasted halibut recipe with cilantro pesto sauce relies on a couple of tricks to produce moist halibut steaks packed with delicious flavors that no one can resist - even people who think they don't like fish! First, you pan roast the halibut steaks to ensure both moistness and a delicious flavor. Then, while the fish cooks, you make a fast but tasty sauce in your blender or food processor that combines cilantro, garlic, lemon juice, cumin, paprika, and a dash of cayenne. Something about this combination makes the flavor addictively good - as you'll notice when everyone wants seconds and thirds! In my experience, this pan-roasted halibut recipe with cilantro pesto works best when the steaks measure at least an inch thick - and even thicker works well. To pan-roast the halibut, all you do is quickly sear the steaks in a skillet for a couple of minutes, which seals in the moisture and browns the fish, bringing out its natural sweetness and intensifying the flavor. Then, put it into the oven to finish cooking without drying out. After about 10 minutes, the halibut will be baked to perfection. Truthfully, you could serve the halibut without the cilantro sauce, as it will be perfectly delicious just as it is. Squeeze a bit of lemon juice on it, take it straight to the table, and enjoy hearing your family or guests rave about its delicious flavor. But the cilantro pesto sauce takes only about a minute to make, as all you need to do is just throw the ingredients into the food processor or blender for about 30 seconds - so why not make it while the fish cooks? Total cooking/prep time: about 15 minutes! And if you're lucky, you'll have a bit of the sauce left over to use as a marinade for chicken, to flavor vegetables such as steamed broccoli or cauliflower, or to blend with some sour cream for a great dip. That's what this yummy cilantro pesto sauce is called in Morocco and other North African countries where it is a traditional marinade for fish or meat. I first tasted it in a Moroccan restaurant in Paris - and have been making it to rave reviews ever since. Traditional recipes often include preserved lemons and coriander along with the other ingredients. The chermoula will keep in the refrigerator for several days - so if you want to shorten your time for making this halibut recipe, you can prepare it ahead of time. Take the halibut out of the refrigerator about 30 minutes before cooking to bring to room temperature. Brown the halibut for only 2 minutes on each side. As noted above, finish the baking in a lower oven temperature of 325°F. Start checking for doneness at 8 minutes. As soon as it flakes (about 9 minutes for the halibut in the photo above), it's done. 1. Throw all of the ingredients into your food processor (or blender). 2. Process for 30 seconds. That's it - almost embarrassingly easy! This recipe makes about 1 cup. If you have any leftovers, freeze it and then add it for flavor the next time you make soup. Serve the halibut on a platter. Spoon some of the pesto sauce on top, with the rest in a small bowl on the side. I usually serve this with sauteed vegetables (cut up about 3 - 4 cups of whatever veggies you have around - red or green peppers, yellow squash, corn, mushrooms, frozen peas), saute them over medium heat in a little olive oil for a few minutes, season with salt and pepper), and pasta or rice. Substitutes for halibut: When halibut reaches $20 per pound in our local fish market, which seems to happen seasonally, we turn to other fish. 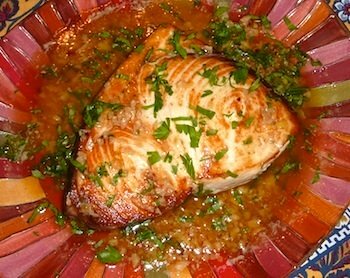 Swordfish, mahi-mahi, and even salmon also work well for this recipe. Start the fish on the grill: Cook 2 minutes on each side over medium heat, and then transfer to a pan and pop in the oven to finish cooking, as described above. You could cook it entirely on the grill if you're better at grilling than I am - for me, the fish always turns out dry. Additions to the sauce: Occasionally I add a small chopped tomato or even avocado for subtle flavor variations. Roast the garlic: Not sure that you'll like raw garlic in the cilantro pesto sauce? Toss the garlic cloves in 1/4 teaspoon olive oil, put them in a small pan (or even on a small piece of aluminum foil), and pop into the oven while it is preheating.